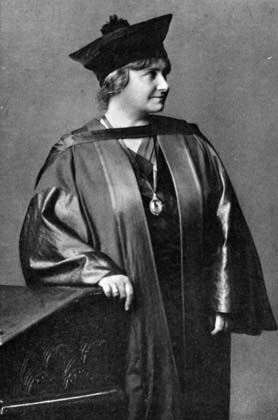 Dr. Maria Montessori was born in Italy in 1870. She began her professional life not as an educator but as a doctor of medicine. After extensive experience in private practice, hospital work and research, she undertook further studies in education, philosophy, psychology and anthropology as a basis for her growing commitment to education. At the age of 37 she took responsibility for a group of underprivileged children in the San Lorenzo district of Rome - founding her first Children's House (Casa dei Bambini). Her unique approach to these children led to surprising results. She observed that when previously unruly children were provided with experiences which corresponded closely to their stage of development, they easily became absorbed in purposeful activities. Challenging activities engendered greater interest than toys. The children generally wished to do things for themselves and were less interested in rewards given for working than in the activity itself. This seemed to her an inherent characteristic of the child. She came to believe that the child's education should proceed in such a way as to provide an environment in which the spontaneous activity of the child would be left free to manifest itself. Fundamental to Montessori's approach was a great respect for the child as an individual. To help the personality towards independence and an awareness of his real position in history appears a lofty aim but it is inherent in all that is done on the practical level of everyday activity. The path to this aim is through providing a supportive yet challenging environment, rich in experience and mindful of the child's capacities and needs. Leading the child towards mastering his environment is the formidable task which is attempted. Success requires an understanding of each child as an individual and an ordering of his specific environment in such a way that he develops progressively an understanding and refinement of his senses, an appreciation of his role as part of a group and above all an independence and sense of internal motivation which will sustain his desire to explore and wonder. This is an excerpt from a talk given by Dr. Montessori in 1942. "...What happened more than thirty years ago now will always remain a mystery to me. I have tried since then to understand what took place in those children. I brought them some of the materials which had been used for our work in experimental psychology, the items which we use today as sensorial material and materials for the exercises of practical life. I merely wanted to study the children's reactions. I asked the woman in charge not to interfere with them in any way as otherwise I would not be able to observe them. They were left alone and little by little the children began to work with concentration and the transformation they underwent, was noticeable. From timid and wild as they were before, the children became sociable and communicative. Their personalities grew and, strange though it may seem, they showed extraordinary understanding, activity, vivacity and confidence. They were happy and joyous. Their fame spread and in consequence all kinds of people visited the House of Children, including State ministers and their wives, until finally also the Queen became interested. She came to that quarter so ill famed that it was considered hell's doors, to see for herself the children about whom she had heard wonders. What was the wonder due to? No one could state it clearly. But it conquered me for ever, because it penetrated my heart as a new light. I changed my whole life. I was nearly 40. I had in front of me a doctors' career and a professorship at the University. But I left all, because I felt compelled to follow [these children], and to find others who could follow them, for I saw that in them lay the secret of the soul. You must realise that what happened was something so great and so stirring that its importance could never be sufficiently recognized. It is not possible that it came because of my method, for at the time my method did not yet exist. This is the clearest proof that it was a revelation that emanated from the children themselves. My educational method has grown from these as well as from many other revelations, given by the children. All the details included in the method, have come from the efforts to follow the child. The new path has been shown us. No one knows exactly how it arose, it just came into being and showed us the new way. It has nothing to do with any educational method of the past, nor with any educational method of the future. It stands alone as the contribution of the child himself. It cannot have come from an adult person; the thought, the very principle that the adult should stand aside to make room for the child, could never have come from the adult. Anyone who wants to follow my method must understand that he should not honour me but follow the child as his leader."